The protest movement that has emerged in Armenia after the February 18 presidential election has proclaimed its next target. Representative of the Armenian Revolutionary Federation’s Supreme Body Armen Rustamyan told the March 5 rally in Yerevan that his party along with the Heritage party of Raffi Hovannisian is going to nominate candidates for the May local elections in Yerevan in order to take power “from below”. Hovannisian, too, stated that they were ready to take power in Yerevan, a city that is home to almost half of Armenia’s population. Hovannisian and his supporters have been accused by many of lacking determination and a clear action plan. But apparently there is a concrete program now, and the opposition is now going to seek a majority of seats in municipal bodies. Local government bodies have been seen as the ruling Republican Party’s support base. The opposition has long claimed that it is municipalities that are being used by the ruling party for election rigging. March 5 also brought another piece of important news regarding the likely future course of events. Parliament Speaker Hovik Abrahamyan said Hovannisian had been asked to head a commission on constitutional reform. Apparently, the Republican Party does not rule out the proposed transition to a proportional system of elections and a parliamentary form of government. It is not excluded that the Republican Party will join this initiative made by several opposition parties last year. These proposals were heard before the parliamentary elections in 2012 and the presidential election in 2013, however, the ruling party rejected them, saying that while it was not against such an approach in principle, it was still early to discuss it. What representatives of the majority meant was that they wanted President Serzh Sargsyan to be elected into office for a second term, and only then, when he will have no possibility to run for the office for the third time, they could consider switching to the parliamentary form of government. Some media have already alleged that Sargsyan is thus paving the way for his becoming prime minister of a parliamentary republic. However, Hovannisian has not yet responded to the offer to serve on the commission. Meanwhile, it is being reported that the initiative of the ARF and Heritage on convening a special session of parliament to discuss the aforementioned issue has failed. 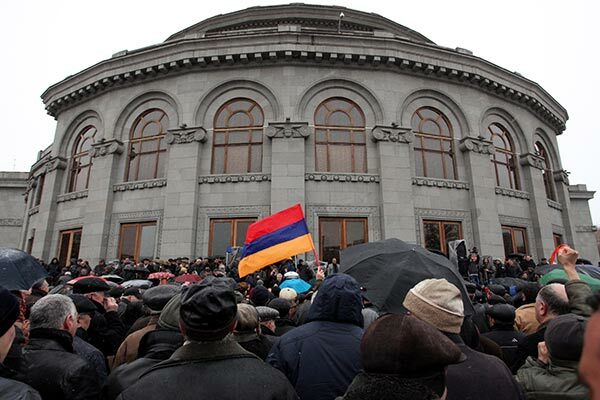 Two factions have begun collecting signatures, but if they fail to enlist the support of the second largest faction of Prosperous Armenia, then they will not be able to gather at least 44 signatures required for such a motion. PAP is still considering whether it should join the initiative, even though it was this party that last year initiated the push for a fully proportional electoral system. It now becomes more and more obvious that the protest movement is not setting tough demands to President Sargsyan, rather it prefers taking a long way of “gaining power from below”, which implies winning at municipal elections, achieving a dissolution of parliament and new legislative elections or a transition to a parliamentary form of government.